Summary: The market town of Skipton is known as the 'Gateway to the Dales'. Could there be a more appropriate start to this unique Yorkshire Dales Long Distance Footpath? The walk begins in the grounds of Skipton Castle and leaves by tracking north and west to Flasby Fell before continuing on to Janet's Foss. 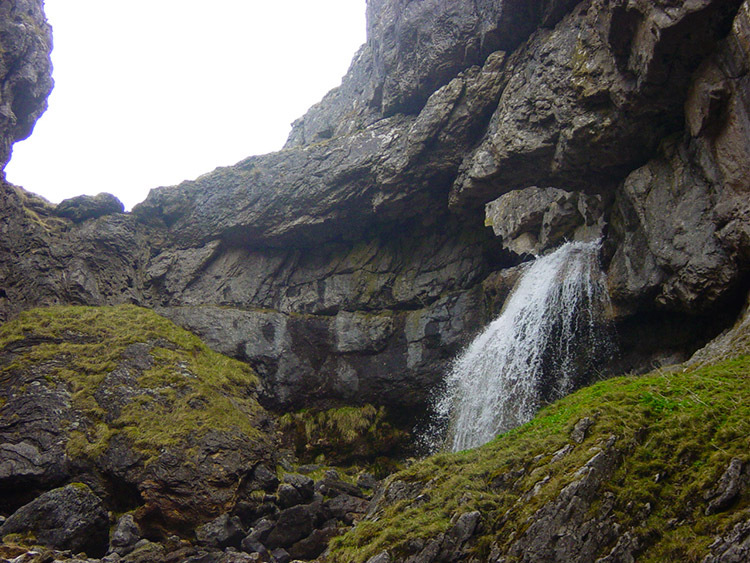 Continue on to Gordale Scar. 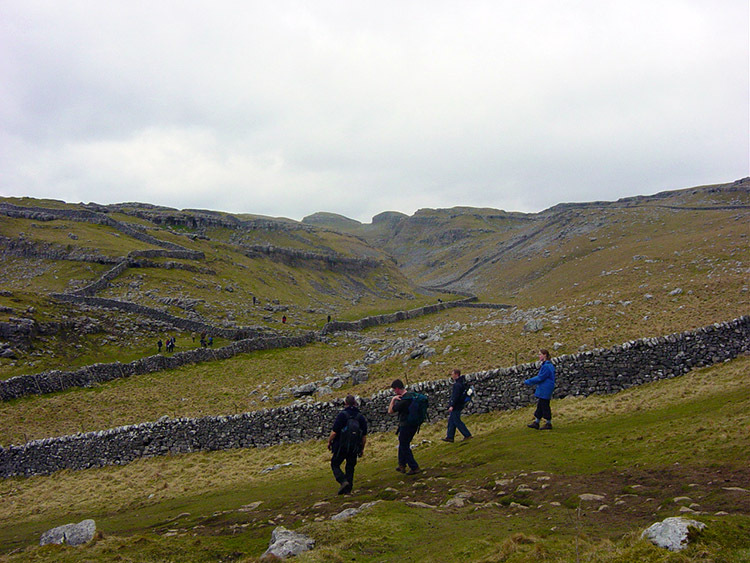 The walk goes up the side of the famous waterfall then bears west to Malham Cove. From this famous tourist attraction the walk leaves the crowds and heads over classic limestone country to Langscar Gate and Kirkby Fell. 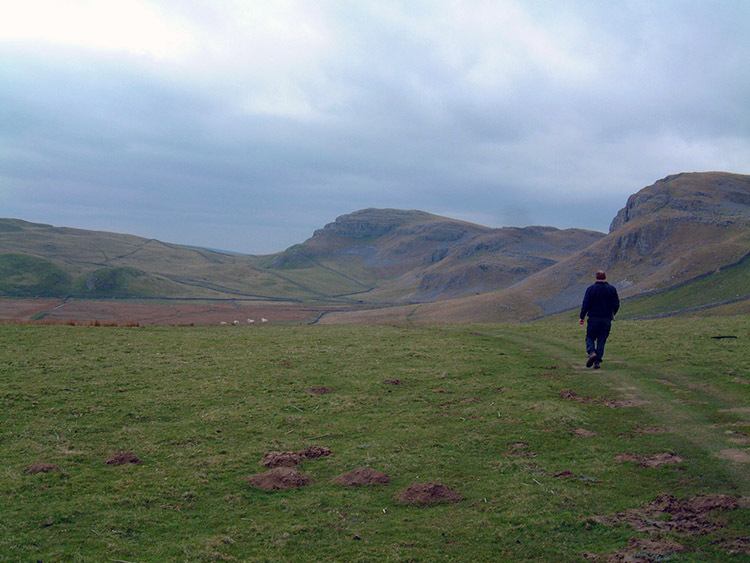 There is still one more major attraction to enjoy as the walk continues on past Attermire Scar before ending the day with a descent into the market town of Settle. I had been looking forward to today for a couple of months, ever since I conceived this unique walk which was planned to capture the character and outstanding beauty of the Yorkshire Dales National Park. My wife Lil drove Steve and I from Leeds to Skipton while Steve's son in law Chris (our third member of the team for the first two days) made his way from Rugby. As arranged we all met up around 8.30am and after a hug from Lil and the obligatory setting off photograph we were on our way...but which way? I had planned the route very carefully and we were to leave Skipton by walking from Skipton Castle up the B6265 before cutting off on a track due north towards Park Hill. We walked up the road but by approaching a junction I knew we had gone too far. Steve could not contain his amusement as I had recently honed my compass and navigation skills yet I couldn't get out of town properly! 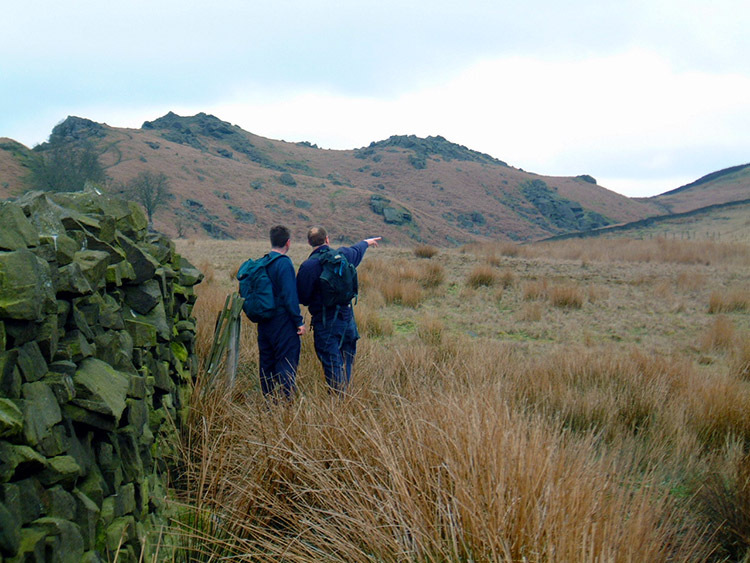 Luckily a local chap was at hand to ask for guidance and he pointed us back down the road to where we had started. The path was up a track immediately from the road at the start of our walk. We walked back and set off up the track and then another local chap asked us where we were going. "To Settle" I said. He replied "You're going the wrong way, its that way" as he pointed back to where we had just started from. I continued the dialogue "No it's not, we're going by Flasby Fell" and as we walked off he mumbled. No matter, I knew I was right now and right enough we left the track by crossing the first of the walks stiles into a field and climbed out of town onto Park Hill. Once over the hill we reached and crossed the Skipton bypass and continued due north over Old Park Golf Course to a metalled road at Tarn Moor. Chris and Steve had a conversation about the strengths and weaknesses of Ipod. I read the map and took us safely over the B6265 and along a track towards Flasby Fell. As we made our way onto the Fell Chris discussed his recent mistake in a yacht race where he took the wrong course. "For a while I thought I was doing extremely well to establish such an early lead before I realised I had set off in the wrong direction". Easily done is not it Chris! The thrill of getting into a long distance walk never ceases for me and I felt fantastic as we made our way onto Flasby Fell. We made good progress which we needed to for today's first stage of 19 miles and we walked the first few miles at a fair pace. Only one stop was made before we reached the trig point on distinctly shaped Rough Haw and that only by Steve for a necessary incursion as he disappeared into the bushes. On Rough Haw we met two ladies with children who had bribed them into exercise by promising them Easter Eggs. They received their prize as we arrived and Chris not wanting to make Steve or I feel left out gave us a mini chocolate bar each. Cheers Chris. From Rough Haw the first height views of the Dales were lovely and I pointed our way down round the edge of a copse. Steve disagreed and said we should walk through a clearing between the copse and a larger wood. Chris agreed I was right but Steve had his way and we followed him down to the clearing. As we reached it a gate said 'No Entry, Private Land'. Let's just say Steve exercised his right to roam and we made our way through the clearing and while we did so Steve eulogised about the majestic setting of the copse with its lovely trees and clumps of Rhododendrons. A woodpecker could also be heard in the copse. Steve was in full flow and continued to tell us of his knowledge of flora and fauna. He mentioned spotting a Stone Martin fluttering in the trees. "A Stone Marten is like a stoat, its not a bird" Chris stated. Steve disagreed, I agreed with Chris. After the debate we left the clearing by scaling a rickety fence and crossing a stream to regain the planned path. We then walked through the village of Flasby and had our first refreshment break near Mickleber Hill. I lost my hat during the break (or at least I thought I had but we had a kleptomaniac in the team - more later) and after our welcome break we moved on round Scarnber Hill to Winterburn Lane. We were all enjoying the walk and discussed a sign seen from a farm on the lane which advertised 'Milk 96% Fat Free'. "Yeah, right" said Steve adding "They don't say the other 4% is pure 100% fat do they" We laughed and then a few yards on Steve disappeared again, this time over a wall. 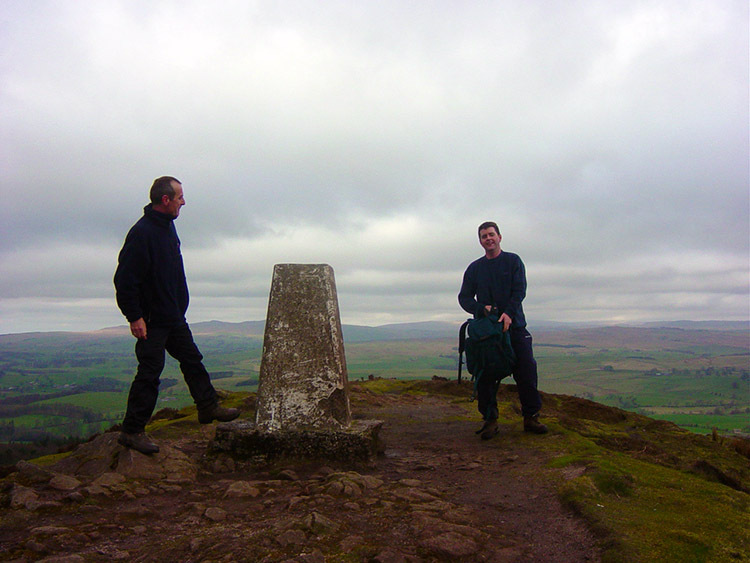 Chris and I walked on up to Cowper Cote where Steve rejoined us. We then walked a further mile to Calton. At Calton we observed renovation work being done on houses where the whole structure was being surrounded by a second outside wall. Presumably they would then knock the inner original walls down? We were not on a structural survey but on a super long distance walk and made on to the fringe of Airton where we joined the banks of the River Aire, our first river walk of the epic. It was on the riverbank that we joined up with the Pennine Way for the first time and walked along it to Hanlith Bridge where we stopped for a second refreshment break and where Steve had his first Red Bull. He likes his energy burst of Bully on long walks and after doing so walked up the steep road through Hanlith like an Olympic athlete. We mere mortals gasped to keep up but keep up we did and after the climb we settled down to a level ground amble to Beck Hole Bridge where we caught our first sighting of the imposing cliff face of Malham Cove. On seeing it we knew the next couple of hours were going to be fantastic. So far we had seen some wonderful dales scenery and typical dales villages but the highlights of today were still ahead of us. Steve and I knew what to expect and we were both eager to get to them. Chris had not seen them all so walked with us in anticipation. At Mires Barn we cut off the Pennine Way and headed east to Mantley Field Laithe. As we did so what had been a quiet walk in our own company became a walk in crowds. We were joining the tourists now for what lied ahead was three of the most visited places in the whole of the Yorkshire Dales. 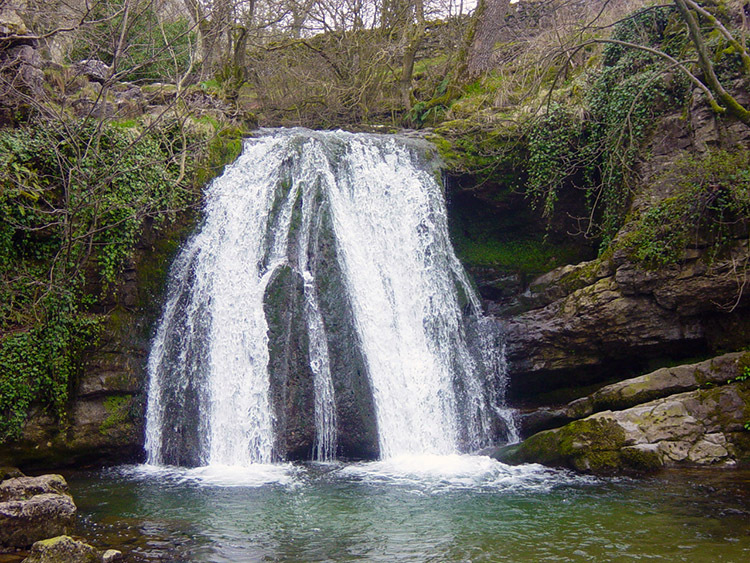 Soon we arrived at the first of them, Janet's Foss. " A Foss is a pool" said Steve trying to explain his knowledge to Chris and I. "No it's not, it's a Scandinavian term for a waterfall" l said. There was an information board on the site confirming my statement. Chris stated "It's clear who is correct now". After briefly enjoying the beauty of Janet's Foss we walked on towards our next highlight of today's leg and for me the pinnacle of the day, Gordale Scar. At the entrance to the gorge that leads to the Scar we stopped for out third and last refreshment stop of the day and did I need it. A week ago I had played golf and pulled my back. I had been unable to walk for three days and had just began to recover a few days ago. I was suffering for sciatic pain in my left leg badly now and needed the rest before climbing up the waterfall of Gordale Scar. Fortunately the pain eased as I rested. And so we walked into the gorge and got our first glimpse of Gordale Scar. Chris was immediately impressed with the sight ahead of him. He had never been here before and said "I Can't believe Vicky has never brought me here" Vicky (Steve's eldest daughter) had taken Chris into the Dales several times during their courtship but never here apparently . 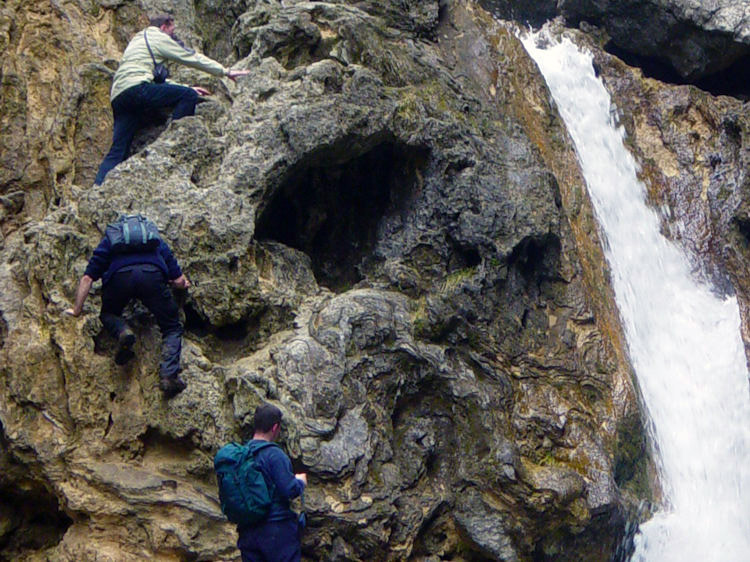 We all enjoyed our scramble up the waterfall and thankfully my sciatica held off as I made it up the climb easily. We then enjoyed the climb up the gorge passing the higher waterfall and reached the top at New Close Knotts. (Gordale Scar is fantastic. Everyone who visits the Dales MUST visit this most fantastic place) Two highlights gone, one to go and so we made our way west to Malham Cove which is probably the most visited spot in the whole of the Dales. 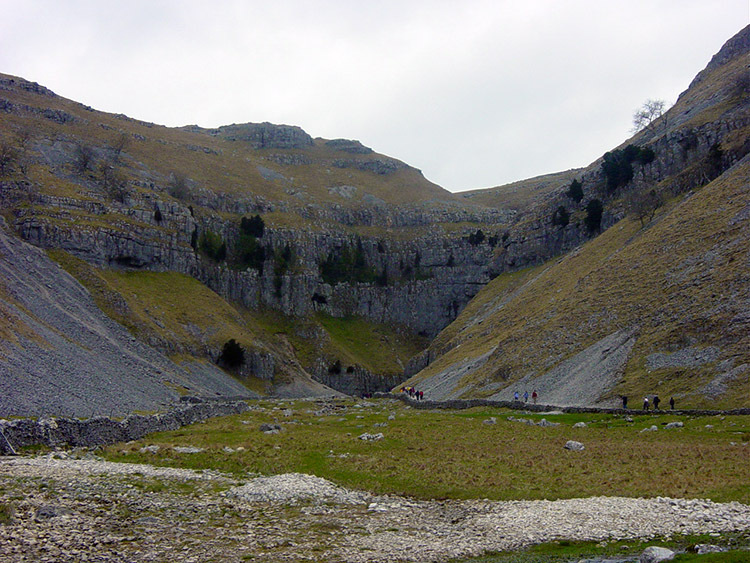 Malham Cove is a huge limestone cliff that stands out majestic to those looking at it from the south. 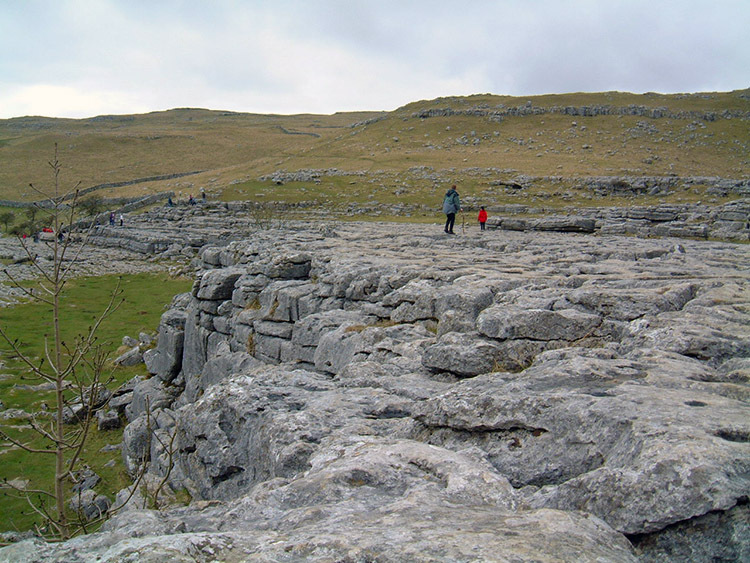 We had seen it at a distance earlier and now were on top of it with its limestone pavement, probably the most walked on limestone pavement in the world. We added to the numbers as we enjoyed gambolling over the limestone before we left and walked west towards Kirkby Fell. From Kirkby Fell it is a classic walk in typical dales landscapes with limestone outcrops everywhere forming the most magnificent shapes, not least the ones at Attermire Scar which was our last highlight of a most fantastic day. We were feeling bushed as we reached Attermire but still lively enough to take in the thrilling scenery. 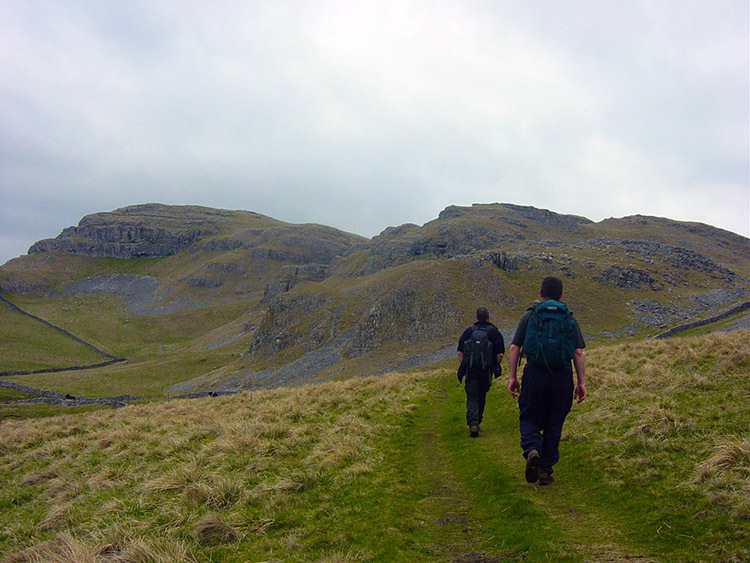 We then walked past the Scar and down into Settle to conclude a fantastic days walking. For Steve and I we had seven more days to look forward to. Chris had but one but none of us will forget what we enjoyed this first day of the 'Dales Celebration Way'. And as for the evening, Lil stayed in Settle with us as it was my birthday at midnight. We all had a super night to round off one really spectacular day walking into the fantastic Yorkshire Dales.